After 54 Years - Christ's Apostle Was Still Ahead of His Time! 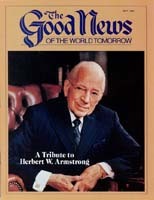 Fifty-five years ago next month - in June, 1931 - Herbert W. Armstrong was ordained into the ministry as an apostle of Jesus Christ. Five years earlier he had been challenged into a diligent study of the Bible. "By spring, 1927, my mind had been swept clean of the religious beliefs I had carelessly assumed, and Jesus Christ had come into my life.... I had been conquered by Christ Jesus. I repented, was baptized and a totally new life begotten in me," is the way Mr. Armstrong described his conversion. Soon small groups of people in God's Church in rural Oregon began to urge him to speak before them. It became clear from the fruits borne even before Mr. Armstrong's ordination that God was calling him to do a special Work. In 1933, God used him to raise up the parent church of the Worldwide Church of God in a country schoolhouse near Eugene, Ore. The Philadelphia church era had begun! The same year, Mr. Armstrong was able to speak on a local 100-watt radio station. Listener response was so outstanding that the station manager suggested Mr. Armstrong do a regular broadcast. Therefore, and purely on faith, what would become the World Tomorrow program went over the airwaves for the first time in January, 1934. In February of that year, the first number of the Plain Truth magazine - all 250 copies - was run off a borrowed mimeograph. With those humble beginnings the Gospel of Jesus Christ was once again being proclaimed publicly as it had not been since the days of the original apostles. The true way to happiness, success and eternal life was once again being vigorously preached and practiced. Restoring true Christianity was pioneering in the truest sense of the word. The spirit of pioneering has never ceased to characterize the Work God has blessed and multiplied through the years. It has grown like a grain of mustard seed. In 1947 Ambassador College was founded in Pasadena, Calif., to provide trained personnel to assist Mr. Armstrong in the Work. As laborers became available, the number of local churches began to increase rapidly, and so did all other facets of the Work. In 1953 the doors opened to preach the Gospel to Europe by radio. Then in 1955, the World Tomorrow program, well on its way to becoming the largest radio program on earth, went on television for the first time: Meanwhile, the Plain Truth magazine increased in size and quality. A man of vision and foresight, Mr. Armstrong constantly adapted and used any workable means available to proclaim God's truth as a witness to the world. These means have included, besides radio, television and The Plain Truth and other magazines, including The Good News, meetings with world leaders, advertisements in national and international publications, public lectures, the publishing of books as well as free booklets and articles and the sponsoring of selected cultural and humanitarian programs. Never before have such channels of communication been so effectively used for good! Right up until his death on Jan. 16, 1986, Mr. Armstrong continued to provide dynamic and vibrant leadership to the growing Work God built through him. During the last year of his life, Mr. Armstrong made extensive trips to Asia and Europe to preach and oversee Church-sponsored projects. He participated in the 40th anniversary of the signing of the United Nations charter in San Francisco, Calif.
Mr. Armstrong also completed the writing of what may be the most important book in the past 1,900 years: Mystery of the Ages. This book, offered free to the general public, takes the pieces of the jigsaw puzzle that is the Bible and puts them all together in clear, understandable form to explain the vital truths that so few today grasp. Requests from readers for Mystery of the Ages broke all records for distribution of Mr. Armstrong's writings in such a short time. On Jan. 10, 1986, Mr. Armstrong appointed longtime minister Joseph W. Tkach, director of Church Administration, to succeed him as Pastor General upon his death. After more than half a century, God's Work still looks beyond today's troubled world and points the way to the peaceful world tomorrow, preaching the Gospel of the Kingdom of God to humanity and training those God calls for positions of leadership and service in that soon-coming Kingdom. Here, in pictures, are some of the highlights in God's Work over the past 54 years.